Details from a confidential U.N. Group of Experts report on Congo emerged last week that show that smuggling of minerals into Rwanda and Burundi is on the rise, in spite of Congolese government efforts to regulate the trade. Furthermore, it seems that the profits from minerals clandestinely transported across the border are being used to fund the M23 rebellion, which began in April and has left half a million people displaced. An incident and court case that transpired in Goma earlier this month provides a compelling illustration of how those smuggling operations work. A new field dispatch written by the Enough Project team describes how Congolese authorities intercepted two tons of coltan, allegedly en route to Rwanda, directly from a Congolese commander with links to the National Congress for the Defense of the People, or CNDP—the precursor to the M23 rebellion. The field dispatch features details from testimony provided by several miners at the public trial of Lt. Col. Bazige and two of his bodyguards. These perspectives offer insights into not only the pervasiveness of the illicit trade but also into the ongoing battle to hold people accountable for their crimes—even those caught red-handed. 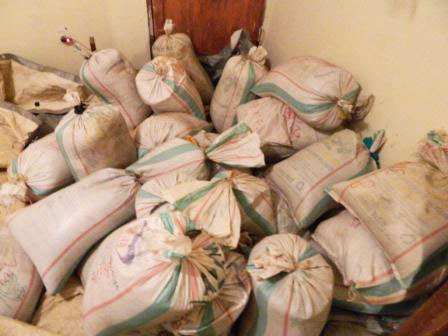 Lt. Col. Bazige and his affiliates are “part of a wide and strong network, and I doubt ex-CNDP colonels … will just give up on them because such a hearing has been organized,” said the driver of a taxi hired by the smugglers to trail the truck transporting minerals. “Even though I fear they’d make a dead man out of me when they get out, I must say that Col. Innocent offered to pay me $30 to help drive a small truck he had already made arrangement for to smuggle the minerals into Rwanda through Kibumba border crossing,” the witness told the court.